This was originally a food service pantry, but was converted to a meeting room in 1922 to accommodate a special luncheon for Mrs. Calvin Coolidge. Its painted wood ceiling and ornamental corner fireplace make it unusual to the rest of the building. The Farragut Room was named after Union Admiral David Glasgow Farragut, commander of the Union Navy and famous for his remark"…damm the torpedoes, full speed ahead." 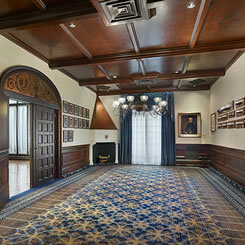 Today the room is used by the League's Yacht Club for meetings as evidenced by the nautical décor on the walls.